It’s LIQUID Group, in collaboration with International ArtExpo, is proud to present Future Identities – Bodies . Places . Spaces | EXTENDED: a selection of artworks presented during the first exhibition of Future Identities, along with new artworks. The exhibition, under thepatronage of the city of Venice, will be held in Venice at Palazzo Albrizzi, from the 12 to the 21 of September 2014. Future Identities is the third event of the festival MORPHOS – Sustainable Empires, organized in Venice in the months between June and November 2014, in the same period of Architecture Biennale. The opening of the event will be on Friday 12 of September 2014 at Palazzo Albrizzi, starting from 05.30 PM (free entry) with the concert of Junges Kammerorchester Stuttgart, followed by the visit of the show. It’s LIQUID Group, in collaboration with International ArtExpo, is proud to announce the opening of Venice Experimental Cinema and Performance Art Festival, International experimental cinema and performance art festival held at Palazzo Ca’ Zanardi, from August 31 to September 02 2014. 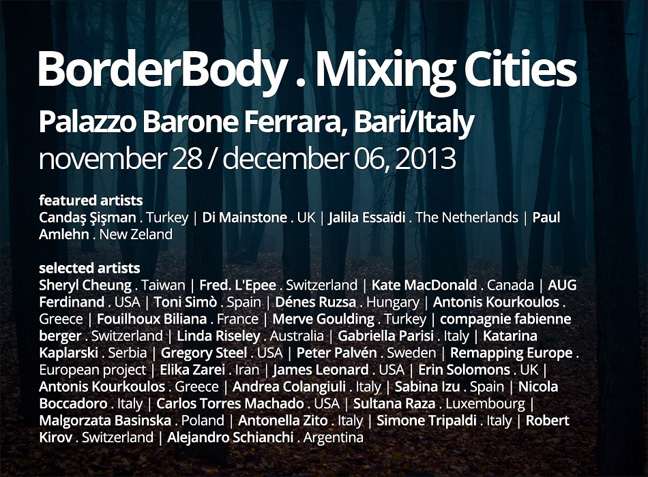 The festival will be part of Future Identities – Bodies . Places . Spaces exhibition, held at Palazzo Albrizzi, from August 23 to September 07 2014 (more info at: www.lucacurci.com/artexpo/opening-future-identities.htm). 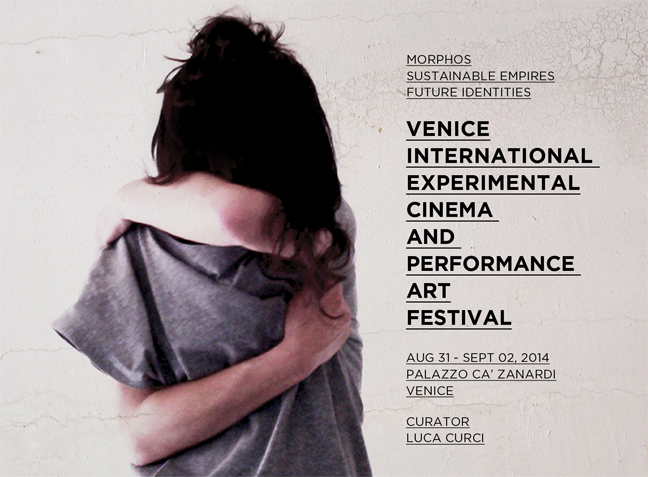 Venice Experimental Cinema and Performance Art Festival is the third event of the festival MORPHOS – Sustainable Empires, organized in Venice in the months between June and November 2014, in the same period of Architecture Biennale. The opening of the event will be on Sunday 31 of August 2014 at Palazzo Ca’ Zanardi, starting from 06.00 PM (free entry). Future Identities – Bodies . Places . Spaces festival is focused on the relationship between body and space, and the hybridization between identities and cultural/physical/social/urban settings in contemporary time. People, backgrounds, societies, progress, cities and all their inputs create hybrid identities, modifying each other and being mixed in prospect to shape a better world. The festival aims to conduct a research and to offer to artists and audience a 360° experience about the body, conceived not only as a material organic system connected to space, but also as an evolving organism with peculiar sensations, feelings and characteristics. 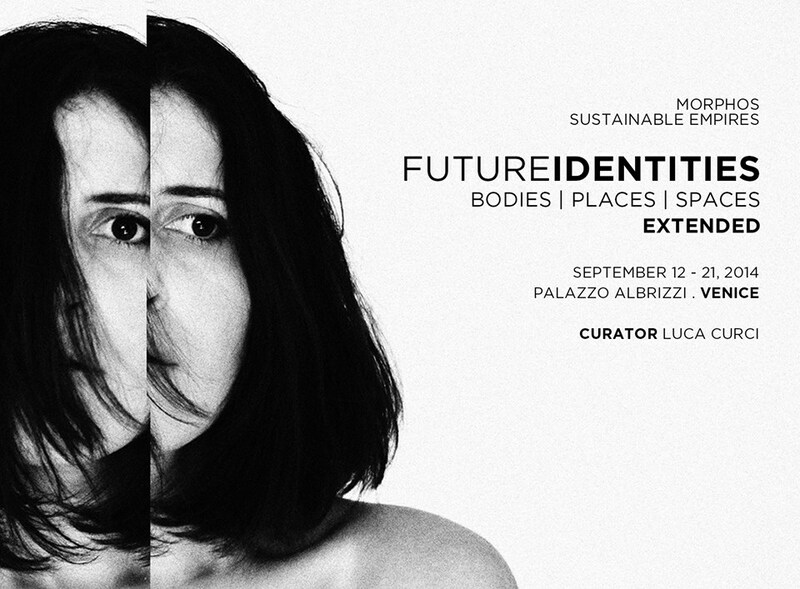 Future Identities will present an exhibition of photography, installation, video-art and architecture works, with a special opening on August 23, 2014 at Palazzo Albrizzi; and the Venice Experimental Cinema and Performance Art Festival, with meeting with artists, at Palazzo Ca’ Zanardi, from August 31 to September 02, 2014. 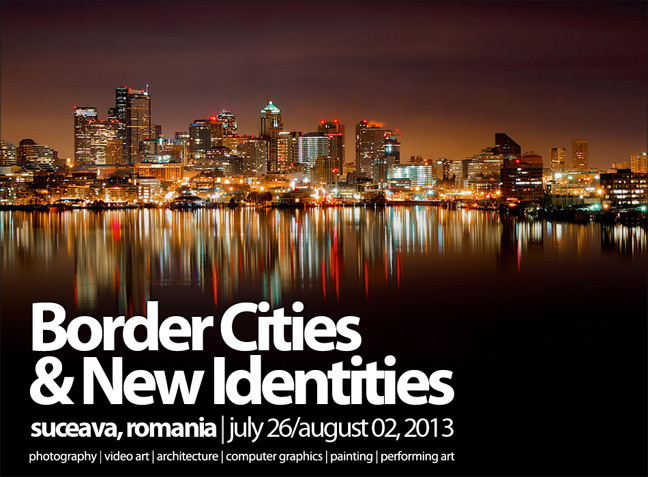 Border Cities & New Identities – International Art Festival of Architecture, Photography, Video Art, Computer Graphics, Painting and Performing Art, will be in Suceava (Romania), at The Water Plant “Uzina de Apa” – Center of Architecture, Urban Culture and Landscape, from the 26th July to 02nd August 2013. Thirty-three artists, from different countries, have been selected to be part of this project. The selection was based on the main concept of hybridization between identities and urban environment, as the result of liquid identities and liquid contacts between people. People, backgrounds, societies, progress and all their inputs creates hybrid identities, modifying each other and being mixed in prospect to shape a better world. Mixing sustainable transport; modern (ICT) communication infrastructure; sustainable economic development; and wise management of natural resources, human, intellectual and social capital, is the key to reach a future better life quality. The Center of Architecture, Urban Culture and Landscape “Uzina de Apa” is the result of a conversion of an old, abandoned Water Plant into a Cultural Center. The project results as a collaboration including municipal authorities, local community and an array of architects, engineers and students. Moreover, private contractors and companies dedicated to innovative techniques are involved to achieve an exemplary public-private partnership. Although originally conceived as a technological construction, the new “Water Plant” is now capable of hosting events ranging from conferences to concerts and exhibitions. By reclaiming its place in the city, this project attempts the true meaning of the word “sustainability” (sus = under and tenere = to hold) – to keep in existence, to maintain and prolong. The press conference will be on Friday the 28th of June 2013 at 11.30 AM, in the Sala Sveva of Castello Svevo (Swabian Castle). The openings of the event will be on Wednesday the 3rd of July 2013 at Castello Svevo (Swabian Castle), at 06.00 PM; and on Thursday the 4th of July 2013 in Santa Teresa dei Maschi at 05.00 PM, and at Sala Murat at 06.00 PM. The event will last until July 31st 2013. The Festival is based on the main concept of the hybridization among art, culture, physical and social identities in contemporary cities, and the mixing between people and space. Urban environments, people, rules and limits are no more distinct realities, but they constantly modify and get mixed together, generating new connections and hybrid results, with undefined ethic, social, sexual and religious borders. Forty-two artists, from all over the world, have been invited to present their artworks related to the theme, during the festival which will be hosted in the three venues of the city of Bari, until the end of July. The aim of the festival is to understand which are the borders still alive in contemporary metropolis, and which ones have become undefined and hybrid. To understand that, artists use material, pictures, sounds, videos and site-specific installations. Fausta Maria Bolettieri and Luca Curci, curators. July 31st 2013, at the end of the Liquid Borders, there will be the selection of the winners of one International Exhibition organized by International ArtExpo and offered by It’s Liquid Group, 3 art residences at Palazzo Calò in Bari (Italy), Tenuta Pinto in Mola di Bari (Italy) and Palazzo Siena in Minervino di Lecce (Italy). The catalogue is edited by Adda Editore. The Castello Svevo (Swabian Castle), symbol of the city of Bari, was built around 1132 by Norman King Roger II. The Castle is surrounded by a moat on all sides, except the northern section, which was bordering the sea and can be accessed from the bridge and the gate on the southern side. It is mainly composed of the Aragon walls and the main Swabian tower, and is currently used for exhibitions. Sala Murat is a cultural space of 400 square meters located in Piazza del Ferrarese, in the centre of Bari. It’s dedicated to art and contemporary exhibition, workshops and conferences. Inside the space it’s permanently exhibited a wall drawing by the minimalist artist Sol LeWitt. Santa Teresa dei Maschi is an ex-cloister, today seat of the Provincial Library for Culture and Arts “De Gemmis”, given in 1952 by Baron de Gennaro Gemmis. Castello Svevo, Santa Teresa dei Maschi, Sala Murat. It’s LIQUID provides information about design companies, new architectural projects, art exhibitions at some of the world’s leading international galleries, museums, institutions, private and public groups, artists, architects, designers selected. It’s LIQUID reaches the combined audiences of International Art Fairs, galleries, museums, and is thus a powerful tool for getting directly to this influential audience with information about exhibition programs and other events. Database demographics: 40% in North America / 45% in Europe / 15% in other locations (South America, Australia, Japan, etc.). Key information: over 100.000 monthly unique visitors / over 500.000 monthly page views / over 80.000 newsletter subscribers.